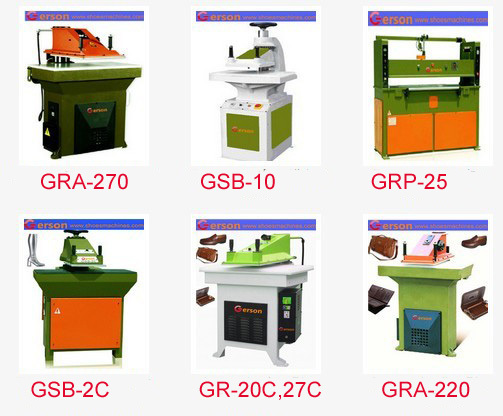 Gerson machinery have many models swing head cutting machine which is die cutting machine with swing head or swing arm ,so called swing head cutting machine. Gerson swing head cutting machine from 8 tons to 28 tons.There have three serials number :GSB,GR,GRA. These swing head cutting machine are widely used for cutting leather,rubber,plastic,cork,paper,sandpaper,fabric,textile etc.,soft and semi-rigid any non-metallic products. 1.Automatic stroke-end setting-up to use cutting knives of different heights without any adjustment. 2.Control push-buttons with built-in device for 5/10 of second maximum delay operation to ensure positive safety. 3.Two push-buttons and one potentiometer to set the cutting power. 4.The main control organs are covered by international patents. 5.The cutting force from 22 tons to 27 tons. 6.Three button handle is available. 1. The swing head machine body are welded by steel sheets with firm structure and light weight. 2. It is provided with automatic lubricating system to lessen abrasion and prolong service life. 4. Double-direction oil way design provides stability and reliability. 5. Two modes such as microcomputer controller and PC electronic circuit are optional for controlling the lower limit position of stroke with high precision, flexibility and convenience.